Part of the Ottoman–Habsburg wars, Polish–Ottoman Wars, Croatian–Ottoman wars, Ottoman–Venetian Wars and Russo-Turkish Wars. The Great Turkish War (German: Der Große Türkenkrieg) or the War of the Holy League (Turkish: Kutsal İttifak Savaşları) was a series of conflicts between the Ottoman Empire and several contemporary European powers joined into a Holy League, beginning in 1683 and ending with the signing of the Treaty of Karlowitz in 1699. The war was a defeat for the Ottoman Empire, which lost large amounts of territory in Central Europe. The war was also significant in that it marked the first time Russia was involved in a western European alliance. After Bohdan Khmelnytsky's rebellion, when the Tsardom of Russia acquired parts of Eastern Ukraine from the Polish–Lithuanian Commonwealth, some Cossacks stayed in the southeast of the Commonwealth. Their leader, Petro Doroshenko, wanted to connect the rest of Ukraine with the Ottoman Empire, starting a rebellion against Hetman (Polish army commander) John Sobieski. Sultan Mehmed IV, who knew that the Polish–Lithuanian Commonwealth was weakened due to internal conflicts, attacked Kamianets-Podilskyi, a large city on the border. The small Polish force resisted the Siege of Kamenets for two weeks but was then forced to capitulate. The Polish Army was too small to resist the Ottoman invasion and could only score some minor tactical victories. After three months, the Poles were forced to sign the Treaty of Buchach in which they agreed to surrender Kamyanets-Podilsky, Podolia and to pay tribute to the Ottoman Sultan. When the news about the defeat and treaty terms reached Warsaw, the Sejm refused to pay the tribute and organized a large army under Jan Sobieski; subsequently, the Poles won the Battle of Khotyn (1673). After King Michael's death in 1673, Jan Sobieski was elected king of Poland; he subsequently tried to defeat the Ottomans for four years, with no success. The war ended on 17 October 1676 with the Treaty of Żurawno in which the Turks only retained control over Kamianets-Podilskyi. This Turkish attack also led in 1676 to the beginning of the Russo-Turkish Wars. After a few years of peace, the Ottoman Empire attacked the Habsburg Empire. The Turks almost captured Vienna, but John III Sobieski led a Christian alliance that defeated them in the Battle of Vienna, stalling the Ottoman Empire's hegemony in south-eastern Europe. A new Holy League was initiated by Pope Innocent XI and encompassed the Holy Roman Empire (headed by Habsburg Austria), Polish–Lithuanian Commonwealth and the Venetian Republic in 1684, joined by Russia in 1686. The second Battle of Mohács was a crushing defeat for the Sultan. The Turks were more successful on the Polish front and were able to retain Podolia during their battles with the Polish–Lithuanian Commonwealth. Russia's involvement marked the first time the country formally joined an alliance of European powers. This was the beginning of a series of Russo-Turkish Wars, which continued into the 20th century. As a result of the Crimean campaigns and Azov campaigns, Russia captured the key Ottoman fortress of Azov. Following the decisive Battle of Zenta in 1697 and lesser skirmishes (such as the Battle of Podhajce in 1698), the League won the war in 1699 and forced the Ottoman Empire to sign the Treaty of Karlowitz. The Ottomans ceded most of Hungary, Transylvania and Slavonia to the Habsburg Empire while Podolia returned to Poland. Most of Dalmatia passed to Venice, along with the Morea (the Peloponnese peninsula), which the Ottomans reconquered in 1715 and regained in the Treaty of Passarowitz of 1718. After allied Christian forces had captured Buda from the Ottoman Empire in 1686 during the Great Turkish War, Serbs from Pannonian Plain (present-day Hungary, Slavonia region in present-day Croatia, Bačka and Banat regions in present-day Serbia) joined the troops of the Habsburg Monarchy as separate units known as Serbian Militia. Serbs, as volunteers, massively joined the Austrian side. In the first half of 1688, the Habsburg army, together with units of Serbian Militia, captured Gyula, Lipova and Ineu from the Ottoman Empire. After Belgrade had been liberated from the Ottomans in 1688, Serbs from the territories in the south of Sava and Danube rivers began to join Serbian Militia units. Venice had held several islands in the Aegean and the Ionian seas, together with strategically positioned forts along the coast of the Greek mainland since the carving up of the Byzantine Empire after the Fourth Crusade. However, with the rise of the Ottomans, during the 16th and early 17th centuries, they lost most of these, such as Cyprus and Euboea (Negropont) to the Turks. Between 1645 and 1669, the Venetians and the Ottomans fought a long and costly war over the last major Venetian possession in the Aegean, Crete. During this war, the Venetian commander, Francesco Morosini, came into contact with the rebellious Maniots, for a joint campaign in the Morea. In 1659, Morosini landed in the Morea, and together with the Maniots, he took Kalamata. However, he was soon after forced to return to Crete, and the Peloponnesian venture failed. In 1683, a new war broke out between Austria and the Ottomans, with a large Ottoman army advancing towards Vienna. In response to this, a Holy League was formed. After the Ottoman army was defeated in the Battle of Vienna, the Venetians decided to use the opportunity of the weakening of Ottoman power and its distraction in the Danubian front so as to reconquer its lost territories in the Aegean and Dalmatia. 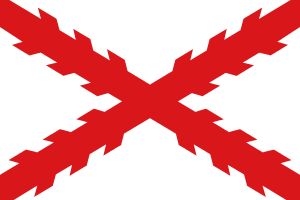 On 25 April 1684, the Most Serene Republic declared war on the Ottomans. Aware that she would have to rely on her own strength for success, Venice prepared for the war by securing financial and military aid in men and ships from the Knights of Malta, the Duchy of Savoy, the Papal States and the Knights of St. Stephen. In addition, the Venetians enrolled large numbers of mercenaries from Italy and the German states, especially Saxony and Brunswick. In mid-June, the Venetian fleet moved from the Adriatic towards the Venetian-held Ionian Islands. The first target was the island of Lefkada (Santa Maura), which fell, after a brief siege of 16 days, on 6 August 1684. The Venetians, aided by Greek irregulars, then crossed into the mainland and started raiding the opposite shore of Acarnania. Most of the area was soon under Venetian control, and the fall of the forts of Preveza and Vonitsa in late September removed the last Ottoman bastions. These early successes were important for the Venetians not only for reasons of morale, but because they secured their communications with Venice, denied to the Ottomans the possibility of threatening the Ionian Islands or of ferrying troops via western Greece to the Peloponnese, and because these successes encouraged the Greeks to cooperate with them against the Ottomans. Having secured his rear during the previous year, Morosini set his sights upon the Peloponnese, where the Greeks, especially the Maniots, had begun showing signs of revolt and communicated with Morosini, promising to rise up in his aid. Ismail Pasha, the new military commander of the Morea, learned of this and invaded the Mani peninsula with 10,000 men, reinforcing the three forts that the Ottomans already garrisoned, and compelled the Maniots to give up hostages to secure their loyalty. As a result, the Maniots remained uncommitted when, on 25 June 1685, the Venetian army, 8,100 men strong, landed outside the former Venetian fort of Koroni and laid siege to it. The castle surrendered after 49 days, on 11 August, and the garrison was massacred. After this success, Morosini embarked his troops towards the town of Kalamata, in order to encourage the Maniots to revolt. The Venetian army, reinforced by 3,300 Saxons and under the command of general Hannibal von Degenfeld, defeated a Turkish force of ca. 10,000 outside Kalamata on 14 September, and by the end of the month, all of Mani and much of Messenia were under Venetian control. Nafplion, or Napoli di Romagna, in the mid-16th century. In October 1685, the Venetian army retreated to the Ionian Islands for winter quarters, where a plague broke out, something which would occur regularly in the next years, and take a great toll on the Venetian army, especially among the German contingents. In April next year, the Venetians helped repulse an Ottoman attack which threatened to overrun Mani, and were reinforced from the Papal States and Tuscany. The Swedish marshal Otto Wilhelm Königsmarck was appointed head of the land forces, while Morosini retained command of the fleet. On 3 June Königsmarck took Pylos, and proceeded to lay siege the fortress of Navarino. A relief force under Ismail Pasha was defeated on June 16, and the next day the fort surrendered. The garrison and the Muslim population were transported to Tripoli. Methoni (Modon) followed on 7 July, after an effective bombardment destroyed the fort's walls, and its inhabitants were also transferred to Tripoli. The Venetians then advanced towards Argos and Nafplion, which was then the most important town in the Peloponnese. The Venetian army, ca. 12,000 strong, landed around Nafplion between 30 July and August 4. Königsmarck immediately led an assault upon the hill of Palamidi, then unfortified, which overlooked the town. Despite the Venetians' success in capturing Palamidi, the arrival of a 7,000 strong Ottoman army under Ismail Pasha at Argos rendered their position difficult. The Venetians' initial assault against the relief army succeeded in taking Argos and forcing the pasha to retreat to Corinth, but for two weeks, from 16 August, Königsmarck's forces were forced to continuously repulse attacks from Ismail Pasha's forces, fight off the sorties of the besieged Ottoman garrison and cope with a new outbreak of plague. On 29 August 1686 Ismail Pasha attacked the Venetian camp, but was heavily defeated. With the defeat of the relief army, Nafplion was forced to surrender the on September 3. News of this major victory were greeted in Venice with joy and celebration. Nafplion became the Venetians' major base, while Ismail Pasha withdrew to Achaea after strengthening the garrisons at Corinth, which controlled the passage to Central Greece. Despite losses to the plague during the autumn and winter of 1686, Morosini's forces were replenished by the arrival of new German mercenary corps form Hannover in spring 1687. Thus strengthened, he was able to move against the last major Ottoman bastion in the Peloponnese, the town of Patras and the fort of Rion, which along with its twin at Antirrion controlled the entrance to the Corinthian Gulf (the "Little Dardanelles"). On 22 July 1687, Morosini, with a force of 14,000, landed outside Patras, where the new Ottoman commander, Mehmed Pasha, had established himself. Mehmed, with an army of roughly equal size, attacked the Venetian force immediately after it landed, but was defeated and forced to retreat. At this point panic spread among the Ottoman forces, and the Venetians were able, within a few days, to capture the citadel of Patras, and the forts of Rion, Antirrion, and Nafpaktos (Lepanto) without any opposition, as their garrisons abandoned them. This new success caused great joy in Venice, and honours were heaped on Morosini and his officers. Morosini received the victory title "Peloponnesiacus", and a bronze bust of his was displayed in the Great Hall, something never before done for a living citizen. The Venetians followed up this success with the reduction of the last Ottoman bastions in the Peloponnese, including Corinth, which was occupied on 7 August, and Mystra, which surrendered later in the month. The Peloponnese was under complete Venetian control, and only the fort of Monemvasia (Malvasia) in the southeast continued to resist, holding out until 1690. After a few years of peace, the Ottoman Empire attacked the Habsburg Empire again. The Turks almost captured the Empire's capital of Vienna, but king of Poland John III Sobieski led a Christian alliance that defeated them in the Battle of Vienna which shook the Ottoman Empire's hegemony in south-eastern Europe. A new Holy League was initiated by Pope Innocent XI and encompassed the Holy Roman Empire (headed by Habsburg Austria), the Venetian Republic and Poland in 1684, joined by Muscovite Russia in 1686. 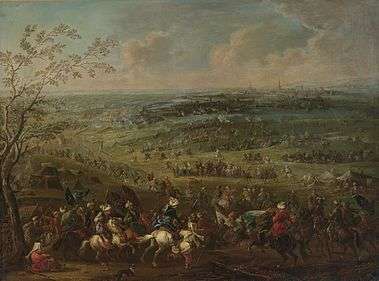 Ottomans suffered two decisive defeats against the Holy Roman Empire: the second Battle of Mohács in 1687 and a decade later, in 1697, the battle of Zenta. On the smaller Polish front, after the battles of 1683 (Vienna and Parkany), Sobieski, after his proposal for the League to state a major coordinated offensive, undertook a rather unsuccessful offensive in Moldavia in 1686, with the Ottomans refusing a major engagement and harassing the army. For the next four years Poland would blockade the key fortress at Kamenets, and Ottoman Tatars would raid the borderlands. In 1691, Sobieski undertook another expedition to Moldavia, with slightly better results, but still with no decisive victories. 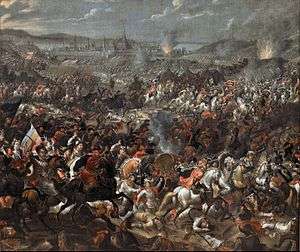 The last battle of the campaign was the battle of Podhajce in 1698, where Polish hetman Feliks Kazimierz Potocki defeated the Ottoman incursion into the Commonwealth. The League won the war in 1699 and forced the Ottoman Empire to sign the Treaty of Karlowitz. The Ottomans lost much of their European possessions, with Podolia (including Kamenets) returned to Poland with imposion of Austria. During the war, the Russian army organized the Crimean campaigns of 1687 and 1689 both which ended in Russian defeats. Despite these setbacks, Russia launched the Azov campaigns in 1695 and 1696, and after raising the siege in 1695 successfully occupied Azov in 1696. Capturing the city of Vienna had long been a strategic aspiration of the Ottoman Empire, because of its interlocking control over Danubian (Black Sea to Western Europe) southern Europe, and the overland (Eastern Mediterranean to Germany) trade routes. During the years preceding this second siege (the first had taken place in 1529), under the auspices of grand viziers from the influential Köprülü family, the Ottoman Empire undertook extensive logistical preparations, including the repair and establishment of roads and bridges leading into the Holy Roman Empire and its logistical centres, as well as the forwarding of ammunition, cannon and other resources from all over the Ottoman Empire to these centres and into the Balkans. Since 1679, the plague had been raging in Vienna. The main Ottoman army finally laid siege to Vienna on 14 July. On the same day, Kara Mustafa sent the traditional demand for surrender to the city. Ernst Rüdiger Graf von Starhemberg, leader of the remaining 15,000 troops and 8,700 volunteers with 370 cannon, refused to capitulate. Only days before, he had received news of the mass slaughter at Perchtoldsdorf, a town south of Vienna, where the citizens had handed over the keys of the city after having been given a similar choice. Siege operations started on 17 July. On 6 September, the Poles under Jan III Sobieski crossed the Danube 30 km north-west of Vienna at Tulln, to unite with the Imperial troops and the additional forces from Saxony, Bavaria, Baden, Franconia and Swabia. Louis XIV of France declined to help his Habsburg rival, having just annexed Alsace. 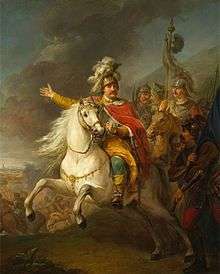 An alliance between John III Sobieski and the Emperor Leopold I resulted in the addition of the Polish hussars to the already existing allied army. The command of the forces of European allies was entrusted to the Polish king, who had under his command 70,000-80,000 soldiers facing a Turkish army of 150,000.:661 John III Sobieski's courage and remarkable aptitude for command were already known in Europe. During early September, the experienced 5,000 Ottoman sappers had repeatedly blown up large portions of the walls between the Burg bastion, the Löbel bastion and the Burg ravelin, creating gaps of about 12m in width. The Viennese tried to counter this by digging their own tunnels to intercept the depositing of large amounts of gunpowder in subterranean caverns. The Ottomans finally managed to occupy the Burg ravelin and the low wall in that area on 8 September. Anticipating a breach in the city walls, the remaining Viennese prepared to fight in the inner city. The relief army had to act quickly to save the city and so prevent another long siege. Despite the binational composition of the army and the short space of only six days, an effective leadership structure was established, centred on the King of Poland and his heavy cavalry (Polish Hussars). The Holy League settled the issues of payment by using all available funds from the government, loans from several wealthy bankers and noblemen and large sums of money from the Pope. Also, the Habsburgs and Poles agreed that the Polish government would pay for its own troops while still in Poland, but that they would be paid by the Emperor once they had crossed into Imperial territory. However, the Emperor had to recognise Sobieski’s claim to first rights of plunder of the enemy camp in the event of a victory. The confederated troops signalled their arrival on the Kahlenberg above Vienna with bonfires. Before the battle a Mass was celebrated for the King of Poland and his nobles. The Ottoman troops were tired and dispirited following the failure of both the attempt at sapping and the assault on the city and the advance of the Holy League infantry on the Turkenschanz. :661 The cavalry charge was one last deadly blow. Less than three hours after the cavalry attack, the Christian forces had won the battle and saved Vienna. The first Christian officer who entered Vienna was Margrave Ludwig of Baden, at the head of his dragoons. Afterwards Sobieski paraphrased Julius Caesar's famous quotation (Veni, vidi, vici) by saying "Veni, vidi, Deus vicit" – "I came, I saw, God conquered". On September 11, 1697, the Battle of Zenta was fought just south of the then-Ottoman city of Zenta. During the battle, Hapsburg Imperial forces routed the Ottoman forces while the Ottomans were crossing the Tisa River (which is near the city). This resulted in the Hapsburg forces killing over 30,000 Ottomans and dispersing the rest. This crippling defeat was the ultimate factor of the Ottoman Empire signing the Treaty of Karlowitz on January 22, 1699, ending the Great Turkish War. This treaty resulted in the transfer of most of Ottoman Hungary to the Habsburgs, and prompted the Ottomans to adopt a more defensive military policy in the following century. Wikimedia Commons has media related to Great Turkish War. ↑ Treasure, Geoffrey, The making of modern Europe, 1648-1780, (Methuen & Co Ltd., 1985), 614. ↑ Sicker, Martin, The Islamic world in decline, (Praeger Publishers, 2001), 32. ↑ Lindsey Hughes, Sophia, Regent of Russia: 1657 - 1704, (Yale University Press, 1990), 206. ↑ Brian Davies,Warfare, State and Society on the Black Sea Steppe, 1500–1700, (Routledge, 2007), 185. ↑ Virginia Aksan, Ottoman Wars, 1700-1860: An Empire Besieged, (Pearson Education Limited, 2007), 28.